A unique concept was recently sprung on the center of Jimbaran fishing village. 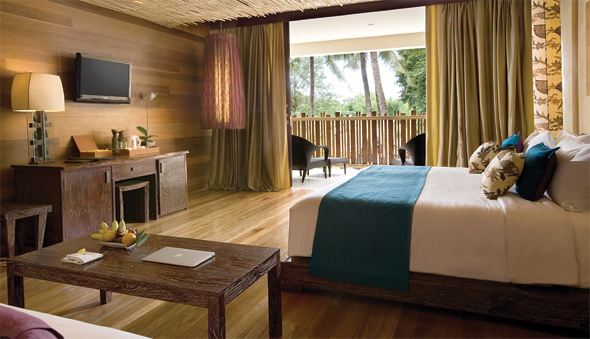 Kupu Kupu Jimbaran Suites was opened on the 1st of April 2011. The hotel aims to be a focal point for guests staying at Jimbaran, boasting 28 suites in 4 categories of spacious rooms in modern contemporary design fused with charming Balinese interior of bengkirai wooden floor, marble walls, teakwood furnishings, coconut shell paneling and beautiful local fabrics. Kupu Kupu Jimbaran Suites offers the height of luxury and aesthetically pleasing Uluwatu Suite, Muaya Duplex Suite, Balangan Suite, and the Jimbaran Family Suite, complete with the luxurious amenities from À L’OCCITANE. A variety of shopping boutique within its own lobby complements the resort, making Kupu Kupu Jimbaran Suites as a paradise for stylish shopping lovers. Top notch dining experiences await at the ground level of the hotel; Topeng Restaurant and Bar is ready to whet your appetite with the finest International cuisines with a touch of French flair by the executive chef, Yehudi. 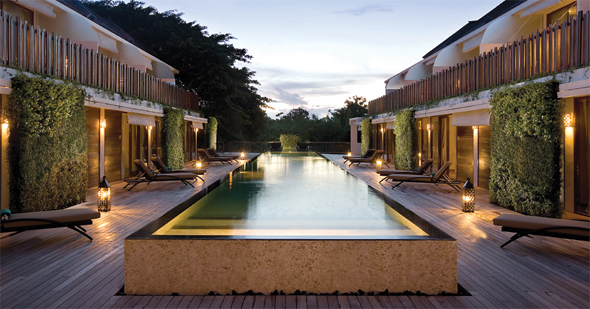 Another dining venue is the fabulous Jimbaran Beach Club that is planned to open on the 1st of July 2011. “We are strategically located near to the sandy beach of Jimbaran, which is famed for its fish market and grilled fish restaurants scattered along the beach. Guests will be spoilt for choice, with the Jimbaran Beach Club promising an unforgettable dining experience with Mediterranean and Tapas foods, tropical cocktails, mocktails and a comprehensive wine list,” exclaimed Ketut Darmiyati, the Director of Sales of Kupu Kupu Jimbaran Suites. The spa boasts an exceptional concept where body well-being and beauty-enhancing rituals are performed in Zen style, bamboo constructed spaces. Unique to The Bamboo Spa, “The Verbana Bamboo Fushion Therapy” is a specialized massage using traditional bamboo sticks associated with À L’OCCITANE’s Verbena formulas to stimulate the flow within the body. 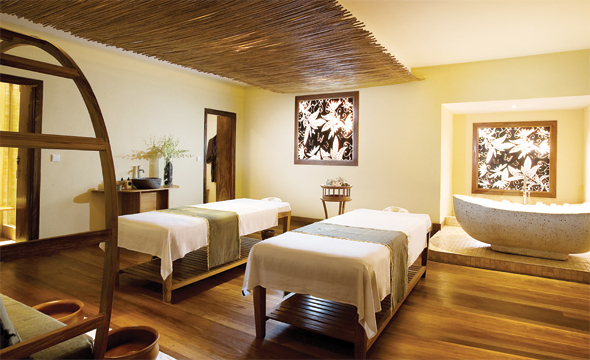 You are transported to a peaceful space in which bliss and wellness are integrated to the art of the living.